The Delhi Blue Pottery Trust was formed in 1991 by Sardar Gurcharan Singh, pioneer potter and father of the studio pottery movement in India. Today, led by Mansimran Singh, Sardarji’s son, an accomplished studio potter in his own right, six other trustees work towards meeting its objectives. The Trust has been instrumental in the growth and development of pottery in India. It played a pivotal role in the initial tentative recognition of pottery as an art form and the rise to its present, widely accepted status. Over the years Delhi Blue Pottery Trust has conducted workshops for potters and students, organized exhibitions, as well as international collaborative potters’ residencies. Promotional activities including demonstrations, lectures, projects for traditional potters and pottery related social programmes, feature on its annual calendar. Workshops at schools and colleges are used as an occasion to initiate wider audiences. The Trust runs two ceramic studios, one at Safdarjang and one in collaboration with Sanskriti Kendra at Anandgram, where students can learn the technical aspects of this art form. As a concomitant initiative, about a decade ago the Trust made porcelain available to potters in India. Porcelain is usually accepted as the most prestigious ceramic, something that has as much to do with the visual quality of the finished product as with the process of creation. The clay body not only needs to be fired at temperatures as high as 1200 to 1400 °C, it is notoriously difficult to work with, being much more demanding than either earthenware or stoneware. Unfortunately, porcelain is not indigenous. This is why, despite, the growing popularity of studio pottery, it remained outside most artists’ media of choice, until the Trust facilitated availability and accessibility. 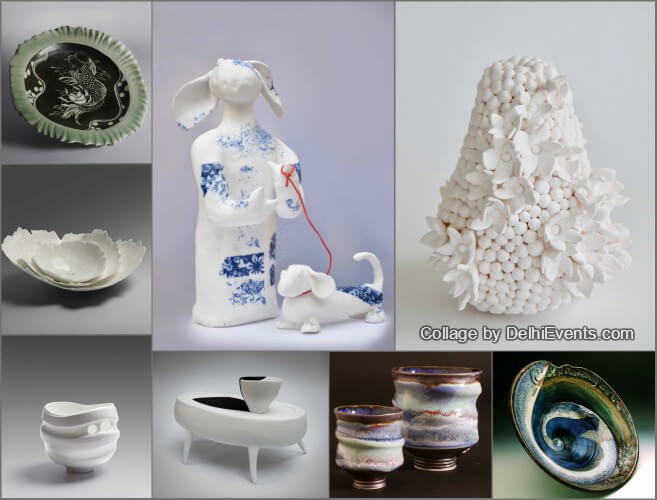 The exhibition reviews the success of this initiative from the point of view of the Trust as well as its impact on the creative ceramic artists’ community. While planning the showcasing of works, it was decided to try an extraordinary experiment: divide the country into 4 zones, North, South, East and West, and curate each zone separately. Doing this would expedite the selection of ceramic artists by individuals familiar with their work. It would also highlight the curators’ own inventiveness and resourcefulness in bringing the theme together. The Trust invited Reyaz Badaruddin (North), Adil Writer (South), Aditi Saraogi (East) and Anjani Khanna (West), to realise this unique concept as ‘Porcelain 2018 – celebrating ten years of porcelain art in India&#39;. Also being exhibited are the works of eminent ceramist Roger Cockram, from the UK, who is the chief guest at the show. At the inauguration of Porcelain 2018, Managing Trustee, Mansimran Singh will launch Hands of Clay written by Padma Shri, B.R Pandit after which Trustee Dr Raj Kubba will read excerpts from the book. This will be followed by a contemporary dance performance entitled Safar, by Rea Krishna accompanied by Asish Paliwal, Shena Gamat, Sukhmani Malik and Vikram Badhwar. A number of workshops and demonstrations will be held during the week of the exhibition.